alaTest has collected and analyzed 488 reviews of Acer Aspire S7-391. The average rating for this product is 3.8/5, compared to an average rating of 4.1/5 for other products in the same category for all reviews. People really like the screen and usability. The design and portability are also mentioned favorably. The connectivity and energy efficiency get critical comments. We analyzed user and expert ratings, product age and more factors. Compared to other products in the same category the Acer Aspire S7-391 is awarded an overall alaScore™ of 88/100 = Very good quality. A striking ultraportable made from metal & glass, with a glorious 1080p IPS touch-screen. You'd be forgiven for assuming the Aspire S7 is a fragile waif, but it's well built and feels sturdy. The 13.3in touchscreen is firmly supported, and you can't help but pick up the S7 and turn it around, admiring the sheer quality of that slimline design. 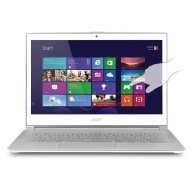 Overall, the Acer Aspire S7 boasts one of the most stylish and desirable laptop designs on the market at present. Its 12mm thick chassis is slim and pleasant to carry around.